The deputy attorney general under George W. Bush, James Comey, provided an unqualified endorsement of massive and illegal National Security Agency (NSA) spying operations in an appearance Tuesday before the Senate Judiciary Committee. Comey, nominated by President Obama to succeed outgoing Federal Bureau of Investigation (FBI) Director Robert Mueller, testified at his confirmation hearing before a friendly bipartisan panel that likewise evinced support for the unconstitutional spying and avoided any serious questioning of his role in sanctioning torture and illegal surveillance under Bush. In stating his support for the NSA spying, Comey repeated the official lies about congressional and judicial oversight and a carefully targeted surveillance effort. In fact, the NSA has been caught out—as a result of the revelations of former NSA contractor Edward Snowden—seizing the telephone records and monitoring the Internet and other communications of virtually every person in the United States and hundreds of millions of people around the world. In the course of the hearing, Comey defended the secret Foreign Intelligence Surveillance (FISA) court that rubber-stamps NSA and FBI spying operations and has emerged as a shadow court, beyond the reach of any of the traditional branches of government. He refused to condemn the force-feeding of detainees at the US prison camp at Guantanamo. Obama’s nomination of Comey and the bipartisan support for his confirmation underscore the seamless transition from the Bush administration and its anti-democratic policies to the Obama administration, which has continued and expanded the police state measures begun under Bush. 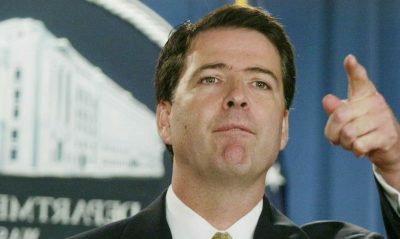 During his tenure in the Bush administration, Comey played a major role in erecting a pseudo-legal framework for unconstitutional torture and surveillance programs. Since leaving the Bush administration in 2005, he has been rewarded with a lucrative career in defense contracting and hedge fund managing, as well as in academia, serving as general counsel for both Lockheed Martin and Bridgewater Associates, and holding the post of senior research fellow at Columbia Law School. In the course of the hearing, senators of both parties as well as Comey engaged in the cynical pretense of questioning the proper “balance” between democratic and privacy rights and the requirements of “national security.” Behind this bogus discussion is the reality of a broad consensus within the political establishment to scrap the Constitution and the Bill of Rights, under the cover of the phony “war on terrorism.” The preparations for dictatorial forms of rule are directed not against foreign terrorists, however, but against the American working class. Citing “the metastasizing terrorist threats,” Comey attempted to downplay the seriousness of the US government’s massive international and domestic surveillance campaign. “I do know as a general matter that the collection of metadata and analysis of metadata is a valuable tool in counterterrorism,” Comey said. Comey was echoed by the senators, who feigned concern over the expansiveness of the surveillance programs in order to present the hearing as a “dialogue.” This was a stage-managed means for allowing Comey to make the case for shredding basic democratic rights. In his opening remarks, the chairman of the committee, Democrat Patrick Leahy of Vermont, encouraged Comey to work with the Senate “to enact some common sense improvements to our surveillance laws.” Comey readily agreed. In fact, Comey repeatedly approved Bush-era surveillance and torture operations, including waterboarding. The surveillance program he refused to sign off on was continued in a slightly different form under Bush and expanded under Obama.